Gravity Flooring had a modest beginning. Its first 'premises' was Jonathan Dowling's small flat in Wandsworth. There were a few rocky years in the recession, but today Gravity Flooring claims to be a force to be reckoned with. Jonathan Dowling started in the trade as a carpet and wood flooring salesman for Tyndale Flooring, which was then owned by his father, who sold the company around 12 years ago. (Tyndale Flooring went into administration in 2011). It was not long before Gravity Flooring outgrew the premises and had to rent its own small warehouse in Sunbury On Thames, and then took over the warehouse next door. Another surge in business meant Gravity Flooring having to move into larger premises including storage facilities and offices in Staines, from where the company operates today. Jonathan and Gary employ 10 people in the office and warehouse, and five fitters. GravityFlooring is involved in both contract and supply.The contracting side of the business has two regular long-term customers from the hotel sector. 'On the supply side, we work equally with the hotel sector and the high-end residential market too,' Jonathan explains. But when the last recession hit, Jonathan's business was reduced to just a couple of top hotel chains. To rebuild the business, Jonathan and Gary began a campaign to contact every past, present and potential client, and soon had a growing number of clients on their books. One recent commission for Gravity Flooring was from Tom Giannini Architects. 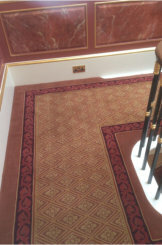 It was to supply and install carpets at a high-end property in Regents Park, London. 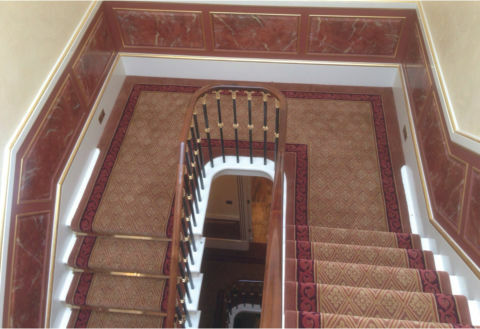 'Designer Tom Giannini came to us because they required specialist precision measuring, templating and designing of carpets for a staircase, corridor and bedrooms,' Jonathan explains. The process started in April 2012 and the installation was split into phases starting in April 2013 and ending in June 2013. 'The templating, designing and coordination for the stairs was the most important aspect after the design of been confirmed because of the intricate alignment of the diamond pattern down the stairs and on the landing. Another challenge was trying to install the carpets while the rest of the building was completed,' he continues. 'Feedback from the client has been extremely positive. He has several other houses of this ilk so we have high hopes. This may not be good news for the long term economy, but it is good news for Gravity Flooring; turnover has recovered since the problems during the recession and the company is growing again. 'We are careful who we work for and usually require payment for products up front,' Jonathan says. 'Our membership of the CFA has been very valuable. I have asked them for help a couple of times over the last few years -- because of sticky situations regarding payment. 'The CFA provided two free consultations with a legal company, which was extremely helpful. He emphasises his strong environmental credentials and uses a baler to compress waste. 'Wherever possible, we buy materials and adhesives from suppliers with committed environmental policies.